The Progress-Focused Approach: Is there a good case for 'positive education'? 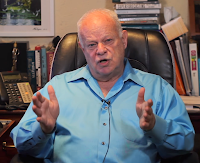 Now, I have come across a new video by Seligman in which he provides more details of positive education. He describes positive education as education in which teaching subject matter is combined with teaching 'happiness skills' like 'well-being, life satisfaction, happiness, and meaning'. He says that these things are both measurable and teachable. And by doing this, education will, according to Seligman, better deliver what parents most want for their children. He then goes on to describe experiments which have been done by Alejandro Adler in Bhutan, Mexico, and Peru and in which, in total, hundreds of thousands of children participated. In those experiments half of the children got 'school as usual' and the other half got 'school as usual plus positive psychology', the 'skills of happiness and well-being'. One and two years later, the schools in which both taught kids both subject matter and 'positive psychology' had happier kids who also scored higher exam-grades. I looked up the studies by Adler and found them here. In the introduction the author writes that his studies show that teaching well-being in parallel to academic performance is both desirable and feasible, regardless of social, economic, or cultural context and that he will "dedicate the rest of my life to promote this new paradigm and help sow the seeds for the world to which humanity can aspire." While this sounds benevolent, I can't help thinking that it also sounds more like what an ideologist would say than like something which a scientist would say. Also, the dissertation does not appear to contain a critical reflection by the author on the limitations of the study which also does raise questions. What does the 'positive psychology' intervention look like? 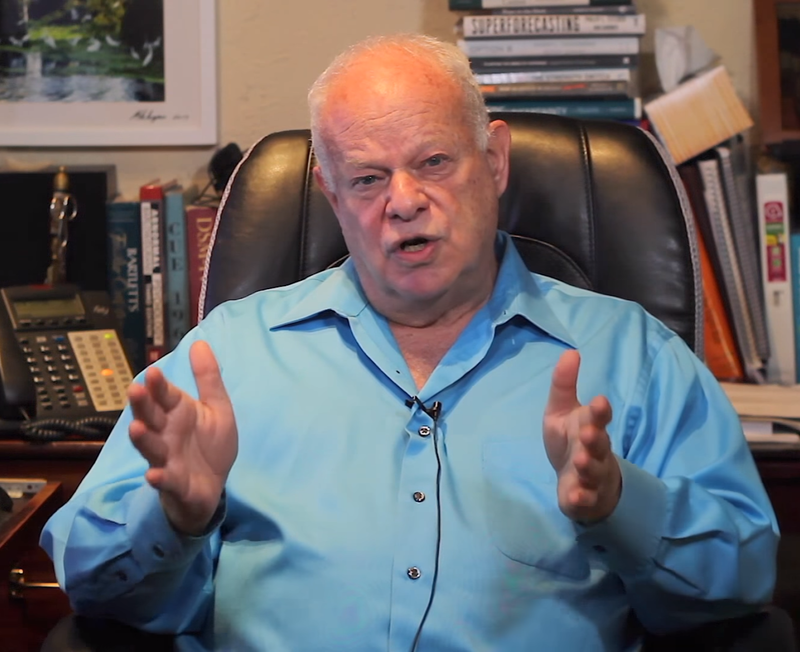 The results in the three studies roughly show what Seligman said in his video. 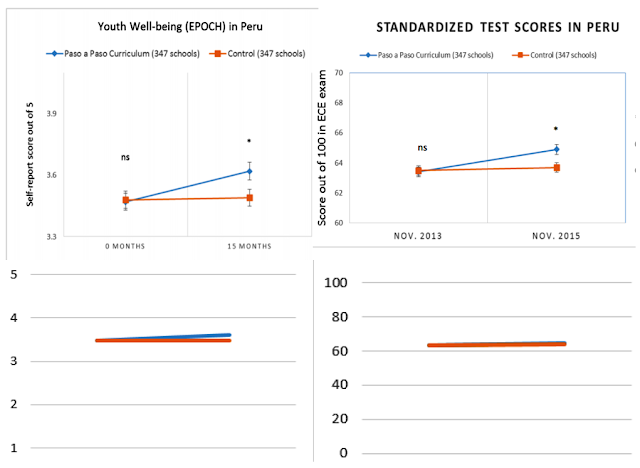 In all three studies, students in the experimental condition showed more well-being and higher grades. In the studies with the relatively small samples (Buthan and Mexico) these effects were moderate and in the large sized Peru sample it was small. Looking at the graphs in the dissertation the found effects may look impressive but this may have to with the fact that the author uses truncated graphs which only display a small part of the actual Y-axis. Below, you can see the graphs which the author used and there-under what they would look when the complete Y-axis would be displayed. This effect does not look impressive, don't you agree? Do such modest effects justify such large scale interventions (which must be costly)? Could the time and money investment not be put to better use? But I have other concerns about this study and the promotion campaign that Adler and Seligman now are on. First, by the nature of the study we can't determine what parts of the intervention contributed to what extent to the effect. The students received an intervention with consisted of 10 different components. 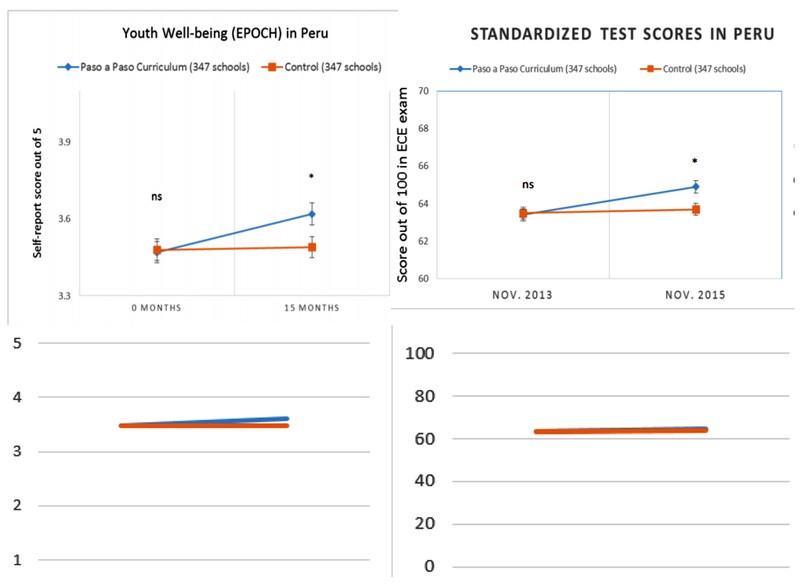 Together, the net effect of the intervention was that these small to moderate improvements in well-being and grades were found. But it could be that some of the components did not at all contribute to the effect and it is even possible that some of them contributed negatively. Are these really all 'positive psychology' or 'well-being'skills? 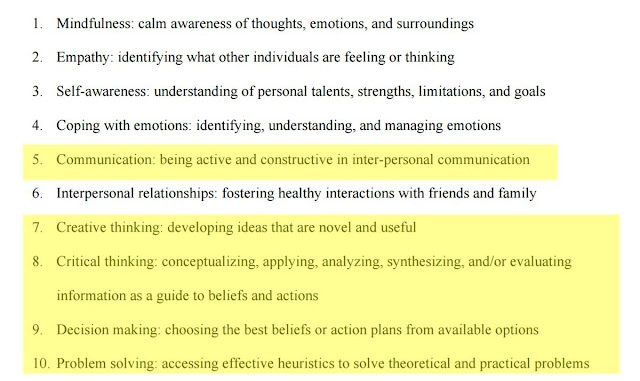 Second, even more importantly, if you look at the content of the intervention components, with respect to at least half of them, I am surprised that they would qualify as positive psychology interventions, let alone as happiness-interventions, or well-being interventions (see, below, the items marked in yellow). 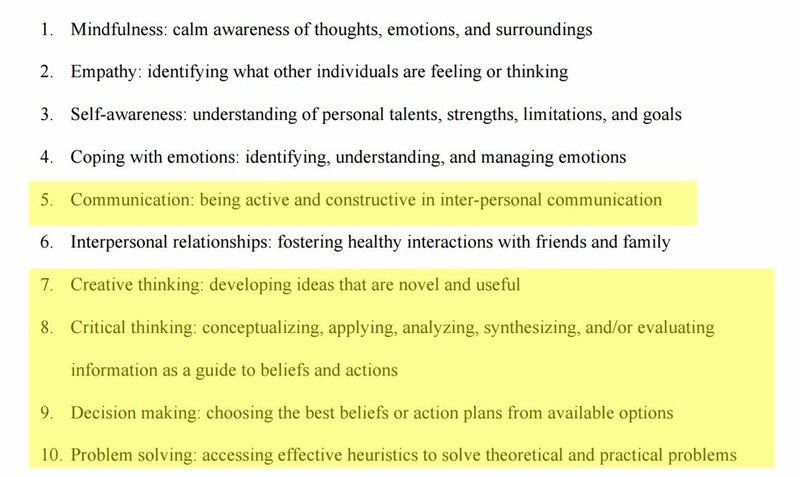 The marked items (especially items 7-10) sound like cognitive/analytic skills which do no have an obvious relation to happiness while they do seem supportive of learning in general. This makes me wonder about several things. Is it justified to label the collection of components as positive psychology skills, or happiness skills? I don't think so. Also, does all of this imply that skills like items 7-10 were not part of the control condition? Shouldn't skills like these be part of the regular curriculum (without them being labeled as positive psychology skills)? The way these studies are presented almost suggests that the researchers try to relabel regular skills so that, from now, on they should be labeled positive psychology skills. Isn't there a simpler explanation for the found effects? Even more fundamentally, isn't there another possible, simpler, explanation for finding these small to moderate improvements in students? Can't it be so that the extra attention and time invested in them as such is an explanation that they did slightly better? Couldn't such effects haven't been achieved by many other types of extra attention and time investments in them? In other words, couldn't the fact that they simply got more training explain the effects? If that extra time had been spent for extra training on subject matter, what results would we then have seen? As you see, I am not convinced. Update 15/06/2017: It was pointed out to me that students in the experimental condition did not get extra time invested in them (relative to the control condition). Sorry for initially missing this point. All my other criticism still stands, I think. I requested additional information (supplemental Materials and information) from the author about (on May 15) but I did not get any reply.